Let’s get some facts straight – I’m no authority on the art that’s cinema. Heck, I’m one of the lot that enjoy their Batmans, Avengers, Transformers – and, because of the kind of education and company that I’ve had – also respond to One Flew Over The Cuckoo’s Nest and Goodfellas. I don’t understand cinema beyond a certain point – I’ve never really understood the meaning of, let’s say, cinematography. I wrote this article some time back, but was sceptical about it, purely because of my inadequacy on the subject. Yet, I choose to write about Ugly. I’m compelled to. Bullied into. Strong armed to write what it did to me, and to probably every other person in the theater. No, not probably. Definitely. I’d gone to watch Ugly expecting a Gangs of Wasseypur – real, yet with considerable cinematic liberties, larger than life characters - and I daresay, caricaturish to an extent. I’d gone in expecting a roller coaster fun ride, typical of Mr. Kashyap (HE deserves a Mister), that you’ll discuss for a couple of hours, maybe some more for a few performances. But, Mr. Kashyap is a wretched, ruthless soul. He cares two hoots about the audience – the comfort that the audience seeks in cinema. With Ugly, he wrenches you right out of your capitalistic comfort, that makes you misbelieve that life’s good. He throws at you in chunks the fact that human beings are the most guttural, convoluted creations ever. He makes you retch at the realization that the characters in Ugly are YOU. And you can’t do anything but swallow the bile right in. Because you know he’s right. Because this film is out to unravel parts of ourselves that we prefer to keep in the shadows, and try to believe that part doesn’t exist at all. I’m not going to write about the story. I’m neither equipped nor entitled to do it. Ugly brings to the fore the basic premise which the human race is seemingly built on. Greed, ambition, loathing and oneupmanship. We’re all opportunists. We’ll ALWAYS put ourselves before others if we benefit out of it. We’ll not hesitate in using people and situations, if that means an extra dram for us. How else can you comprehend what Rahul Varshney, Shoumik Bose, Vineet Singh, Shalini, Sidhdhant or even Rakhee Malhotra do in the course of the film? 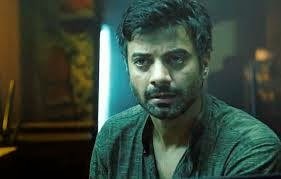 Rahul Varshney – underplayed with absolute brilliance by Rahul Bhat – is an egoistic ”struggler” who despite having lost the chance, refuses to believe he will not become a hero ever. The one who can not pay his rents, and yet has kegs of protein shake in the ramshackle room he calls home. He loses his daughter Kali to a kidnapping. He’s understandably worried in the beginning. Like you’d expect him to. But the said daughter is now a step daughter to Shoumik Bose, his one time arch rival in college – and over whom, Rahul had the ultimate victory. HE got the girl both vied for. Now Shoumik has the girl, and a respectable position in the police department. And a chance to ... we’ll come to Shoumik later – Ronit Roy has ensured there’s one full paragraph on his Shoumik. After a certain point, Kali is not even the reason why Rahul does things that he does. The reasons come from within. Jealousy. Of your arch rival having beaten you, finally. Self gratification. That you’re still better than him, and that you need to prove it to him – when in reality you need to prove it to yourself for assurance. Denial. Of the fact that yours is a life of failed ambitions. You can sense this by the second half of the film, when the dialogues that Rahul mouths have gradually diminishing mentions of Kali, and more of ”I”. More of what ”I” was. More of what ”I” still am. And towards the end, he opens up and tells Shoumik, ”Chu****, khud ko bahut shyana samajhta tha na tu.” That one sentence sums up all the hatred Rahul had foreverything. His life. His failures. Himself. 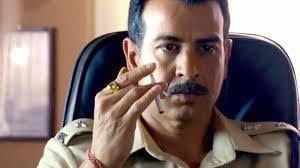 Ronit Roy – oh, the erstwhile band dressed youngster crooning ”Yeh akhkha India jaanta hai hum tumpe marta hai” – is a simmering cauldron of emotions, waiting to burn himself out. He’s what each one of us are. Petting a grudge forever, looking for one chance at rebuttal. For a misguided sense of self gratification. Because by the time it happens, revenge as a dish turns so cold, it stinks. He isn’t as tough as he’d want the world to believe. He has his insecurities, his inhibitions and his self doubts. He tries to curb all of that by being diffident. By being a masochist – who only married the woman he did to indulge himself. Because he’s shorn of all love for the woman, after being violently rejected by her once upon a time. And he retailates by responses like ”Jaa do peg laga ke so jaa”, when she confides into him of her fear of the dark. Who beats up his former rival, in measured, calculated hits. And yet, not once does he show a sign of being satisfied. Because he isn’t. He knows the futility of it all now. Mumbai, the city, is one the most pivotal characters. Mr. Kashyap has managed to show its true colours, without being too documentary – like (”Bhookha, nanga India”? ), a trap that so many film makers have fallen into earlier. No Dharavi slums to show the abject situation the plagued city finds itself in, today. But the dingy little rooms that the average man calls a home, and an office in the metropolis of immeasurable differences. Crumbly buildings, that hold so many families. Shot in such poignant details, that one can actually imagine the stench emanating from one of the open drains. The sounds that Mumbai makes on an everyday basis, caught – unstrangled – and make you believe in everything happening on the screen being SO real. Now, to the scene, that intimidated me to write on a subject I’m scarily ignorant about. And that’s the beauty of it – it isn’t a cinematically brilliant scene. No earth-shattering explosions, and definitely no hero walking away from it, lighting up a cigarette. So you see, THAT is the kind of conclusion that’s brilliant. The conclusion of Ugly. It takes nothing less than sheer disregard to accepted conformity to conclude a film this way. It makes you gasp, clutch the handrest of the seat, meaning to retch, and yet not be able to move your gaze away from the screen. THIS is how such cases end up, and Mr. Kashyap has the unabashed courage to thrust it right into your face, so close that you HAVE to see it. Too close for comfort. With such forcefulness that leaves you speechless. There was a complete hush, even when the film ended and two hundred people were leaving the theater. It was a collective quiet of people reflecting. At shamefully agreeing to themselves, that this is what each one of us is like. Full of malice. Flawed. Imperfect. Ugly is so fundamentally inward and guttural, that it makes you want to believe in the make believe world of superheroes, where a Superman will always be there, swishing past, saving the day. Where even Batman, with all his twisted ways and theatricals, is beautiful. Note: This article was first written as a Facebook Post.